Fact: coffee is delicious. Have you ever tried to go a day without a cup of coffee? Whether you’re having a busy work week and need a pick-me-up, or you’re meeting someone over a cup-of-joe, you deserve to actually enjoy consumption. Don’t you agree? Also fact: There are so many coffee shops in the Nashville area AND so many reasons to have coffee! This is literally one of my favorite coffee, so I’m going to start with it first. When I first moved to Nashville, it was the first coffee shop that I went to. Golden Sound, the Barista Parlor in the Gulch was walking distance from my apartment. This is when I realized how hipster Nashville actually is. People were enjoying a nice cup of French pressed coffee and enjoying a chill atmosphere with an old record player playing cool music. (and of course all of the beards and trendy glasses.) After I enjoyed a nice slayer and milk, I was hooked. I constantly go back there not just for the coffee but for the atmosphere. It’s a great place to meet up with someone, or enjoy on your own. The communal tables make it easy for everyone to get work done or socialize—all are welcome. This is one of the older coffee shops in Nashville, opening in 1993. Not only do they serve you great coffee, but you have all day healthy breakfast menu options to fuel up on. And if you’re looking for beans—they have a roasting operation too. Bongo Java is growing, and its for all the right reasons. Check them out to hang out or catch up on some work. It seems the morning business crowd fills up Dose coffee shop for its expresso and coffee bar. With its two locations, one on the east and one on the west side, Dose is serving up a great morning buzz—plus, they also serve some delicious breakfast and lunch options. The 12 south and surrounding areas have been enjoying the infamous coffee from Frothy Monkey. Not only do they serve up great coffee, but they have their own roast so it’s a totally unique taste—and you can bring the coffee home with you to serve up as you’d like. 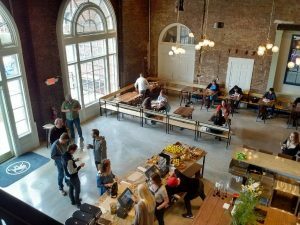 The Frothy Monkey is located in central areas so that you can grab a cup-of-joe and take a walk while you enjoy the local vibes. This coffee house located in the Germantown area will help you feed your coffee and sweet tooth craving. Serving coffee, lattes and expresso, it also haves a wide range of breakfast, savory and sweet crepes. Our Armstrong Real-Estate agents want you to live like a local. We’d love to see you in the beautiful area of 12 south. Here you’ll find Frothy Monkey, shopping, and restaurants all in walking distance from one another. Click HERE to explore the most up to date 12 South listings Nashville has to offer! Give us a call @ 615.807.0579 and we’ll go from there! After you get settled into your new home, we hope you get to explore the area, with a cup of coffee in hand. There are so many more coffee shops for you to enjoy, so go ahead. Start with a few we suggest, and then go explore on your own! We know you won’t be disappointed!